Most women aspire to have smooth, healthy skin free from dry patches, superfluous hair and blemishes. Regular skin brushing will improve the look and feel of your skin. Chances are even if your skin isn’t prone to spottiness or flaky patches, it will suffer from dullness and poor condition from time to time, which is why Skin Brushing is important. The skin plays a vital role in ridding the body of toxins and impurities. Dry skin brushing is one of the best techniques to open up the pores of the skin, and to stimulate and detoxify the lymphatic system. 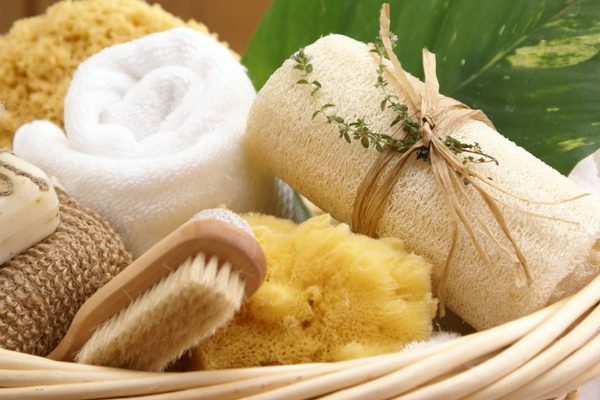 Skin Brushing is always done on dry skin, prior to entering the shower, as this is the best time to remove any dead skin. Always brush in an upward direction towards your heart. 1. Undress and sit on a chair or the edge of the bath so that you can easily reach your feet and lower legs. Take the skin brush, or loofah mitt, and begin with the sole of the right foot. If you are using a brush, use firm, rhythmic strokes to cover the sole several times. If you are using the mitts, you can make the movement more continuous, letting one hand follow the other. Continue the movement as seamlessly as possible over the top of the foot, up toward the ankle and on to the lower leg, making sure that you cover the whole lower leg including the shin and calf. 2. Stand up and brush the area from the knee to the top of the thigh. Again, make sure that you cover the whole area several times with long, rhythmic, upward strokes. 3. Continue brushing over the buttocks, up as high as the waist. Now repeat the whole process on the left leg, starting again at the sole of the left foot. 4. From the top of your buttocks, and keeping the movement in an upward direction, brush the whole of the back several times all the way up to the shoulders. This is the hardest area to cover completely – do the best you can. 5. Next, brush the right arm. Start with the palm of the hand, then back of the hand, then move from the wrist up to the elbow, again always moving upwards. Continue along the upper arm, from the elbow towards the shoulder. Repeat on the left side, starting with the left hand. 6. Very gently, brushing the abdomen in a clockwise circle, (as this aids in digestion). Repeat several times but with a gentle pressure; stop if it feels uncomfortable in any way. 7. Continue on to the chest and neck, always working towards your heart using a gentle pressure. 8. Once completed, follow with a Body Moisturiser. 9. Apply an exfoliant scrub to a wet face, using a gentle patting – release motion with your finger tips. Avoid the skin between cheekbones and brow bones. 10. Once completed, follow with a Face Cream or Oil.